Our solution provides you with tools and features that make trading easier and faster for the community manager, the vendors, and the retailers. It even includes your very own mobile app (for iOS and Android), as well as your own website to place orders. Built around your brand, the White Label solution integrates your image, logo, and colors. This enables suppliers, distributors, brokers, franchisors and corporate chains to project a strong brand image, and have complete control over the possible interactions between members of the community. WEGOTRADE offers you the freedom and power of a complete marketplace without the development costs and integration hassles. 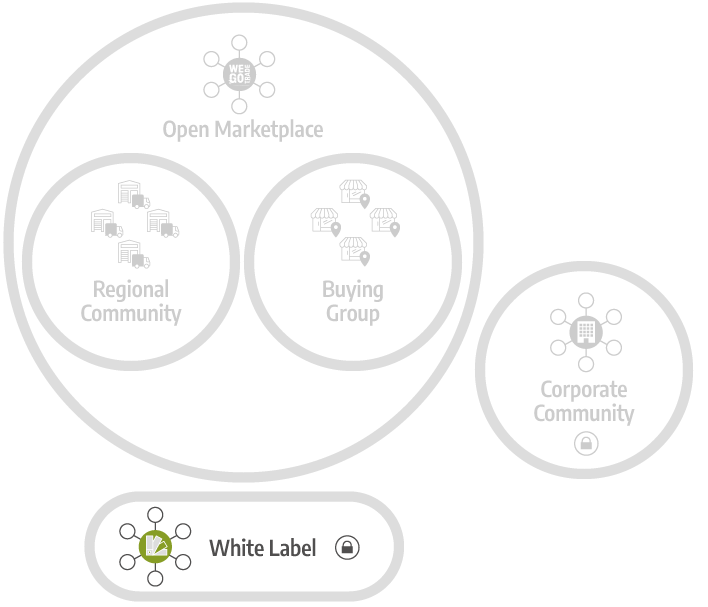 The White Label solution lets you build your own community, accessible only by the vendors and retailers you have selected. Unlike on the Open Marketplace, your retailers can only order from your head office, or directly from vendors you allowed in. You have the high level of control WEGOTRADE offers to Corporate Community managers, plus the opportunity to offer an improved user experience to everybody. The vendors and retailers of this community also benefit from a streamlined purchase management, as well as from the robust back-end that drives their trades. But while the technology behind your community is the WEGOTRADE platform, the retailers see none of it. They only use the app and website that bear your logo and image. You get all the tools you need, such as detailed reports and live access to ongoing orders, to gain a better understanding of the purchasing habits of your members. This will enable you to optimize the trades within your organization, reduce your costs, and simplify the purchasing process. Access to this platform is protected and your catalog will not be published or shared on the Open Marketplace. While you do not get the same exposure, you have total control over your brand’s image and the trades happening within your community. This solution is developed according to your particular needs and can be adapted to work with your existing management systems.